who are offering a prize of $10.00 to spend in their Shop!! That's beautiful Pat. Perfect for a harvest theme and brings back lovely memories for me. 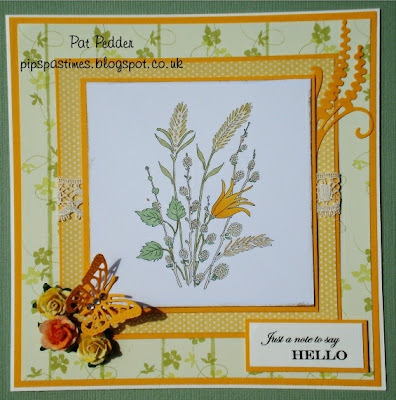 Pat this is so beautifully designed and the colours and embellishments work so well together. Wishing you a fab Wednesday. So beautiful Pat, lovely colours. Lovely card, Pat. I would never have thought of teaming yellow and green but they work so well together. Love the butterfly. Oooh Pat this is so pretty - I love the image and those bright colours - just lovely. Beautifully done Pat! I am going to try to do a little catching up. Since I broke my hip, I have really be behind in absolutely everything!